THE Panel was established by Archbishop Christopher to provide advice to him and the Institute for Professional Standards and Safeguarding (IPSS) Manager, Maria Hicks regarding professional standards and safeguarding. 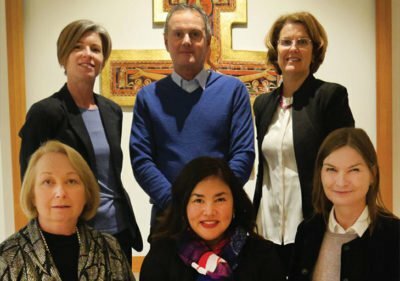 The formation of this Advisory Panel furthers the Archbishop’s commitment to implementing Child Safeguarding Standards within the Archdiocese and as recommended by the Royal Commission. Angela McCabe is a consultant psychologist in private practice. She has held a range of executive and clinical roles, applying behavioural science principles to design, implement and evaluate a range of clinical, forensic and organisational programs, for Government, the United Nations and NGOs. She has a special interest in mental health support, risk management and organizational transition, including the prevention of/or recovery from, betrayal of trust behaviours and traumatic injury. Liesl Centenera is a consultant with her own business specialising in governance, policy and human resources matters. She holds a Dregree in Econiomics and Law and is admitted to practice in the ACT Supreme Court. Liesl currently has appointments as Chair, Bosom Buddies Management Committee; Chair, Music for Canberra Board; and Deputy Chair, Territory Records Advisory Committee. She is also the current Chair of the Sts Peter and Paul School Community Council. Kim Linsell joined CatholicCare in January 1995 as a Student & Family Counsellor. After working for a number of years in both primary and high schools, Kim moved into management, overseeing both the school counselling and family relationship counselling programs. She was later appointed as Director Counselling Services, which has since expanded to also include therapy services. Kim has previously worked in Community Health as a social worker, the Disability sector, providing support to individuals and families, as well as in child protection in South Africa. Kim is a long term member of the Australian Association of Social Workers and has a Masters degree in Human Services. Clare McNamara is an experienced litigator with a broad technical background. In over 18 years of practice she has acted for both private sector and government clients, specialising in commissions of inquiry, dispute resolution, administrative law, and regulatory compliance. Clare has just completed working for the Truth Justice and Healing Council. In this role she was responsible for provision of legal and legal policy advice to and representation of the Council and Church leaders nationally before the Royal Commission. Kim was also responsible for advising Church leaders on the Royal Commission’s recommendations and legislation to establish the national redress scheme for survivors of abuse. Fr Richard Thompson entered St Patrick’s Seminary at Manly in Sydney in 1980 and was ordained at Temora in 1985 for the Archdiocese of Canberra and Goulburn. He was appointed to Young as Assistant Priest and then to Canberra as Principal Hospital Chaplain. In 1988 he joined the Royal Australian Naval Reserve as Chaplain then transferred to fulltime chaplaincy in 1999. Fr Richard entered the Archdiocese of Canberra and Goulburn in 2005. In February 2016 the Archbishop Christopher Prowse appointed Fr Richard as Dean of the Central or (Canberra) Deanery with the title Vicar Forane (VF).